While everything pumpkin flavored heralds in the fall season, spring is announced with an almost glowing, green drink. McDonald’s Shamrock Shake season is in full swing, especially now that we’re not far away from celebrating St. Patrick’s Day. First available at select McDonald’s beginning in 1970, the Shamrock Shake debuted in every stateside McDonald’s in 2012. Now, with over 60 million sold, the Shamrock Shake is taking on a new look in 2017. Make that five new looks. You can now order a Chocolate Shamrock Shake, Chocolate Chip Frappé, Shamrock Hot Chocolate, and Shamrock Mocha alongside the original Shamrock Shake at a McDonald’s near you. While it may be green, the Shamrock Shake hasn’t had the best reputation for being a healthy choice. A large contains 820 calories and 49 different ingredients, not too many of which can be found in your everyday kitchen. Vanilla Reduced Fat Ice Cream: Milk, Sugar, Cream, Corn Syrup, Natural Flavor, Mono and Diglycerides, Cellulose Gum, Guar Gum, Carrageenan, Vitamin A Palmitate. High Fructose Corn Syrup, Corn Syrup, Water, Sugar, Natural Flavor, Xanthan Gum, Citric Acid, Sodium Benzoate (Preservative), Yellow 5, Blue 1. May contain small amounts of other shake flavors served at the restaurant, including egg ingredients when Egg Nog Shakes are available. Whipped Topping: Cream, Nonfat Milk, Corn Syrup, Sugar, High Fructose Corn Syrup, contains 1% or Less: Mono-And Diglycerides, Carrageenan, Polysorbate 80, Beta Carotene (Color), Natural and Artificial Flavor, Mixed Tocopherols (Vitamin E) to Protect Flavor. Whipping Propellant (Nitrous Oxide). Maraschino Cherry: Cherries, Water, Corn Syrup, High Fructose Corn Syrup, Sugar, Malic Acid, Citric Acid, Natural and Artificial Flavors, Sodium Benzoate and Potassium Sorbate (Preservatives), Red 40, Sulfur Dioxide as Preservative (Contains Sulfites). Green Sugar Crystals: Sugar, Yellow 5 Lake, Confectioners Glaze, Blue 1 Lake, Carnauba Wax. 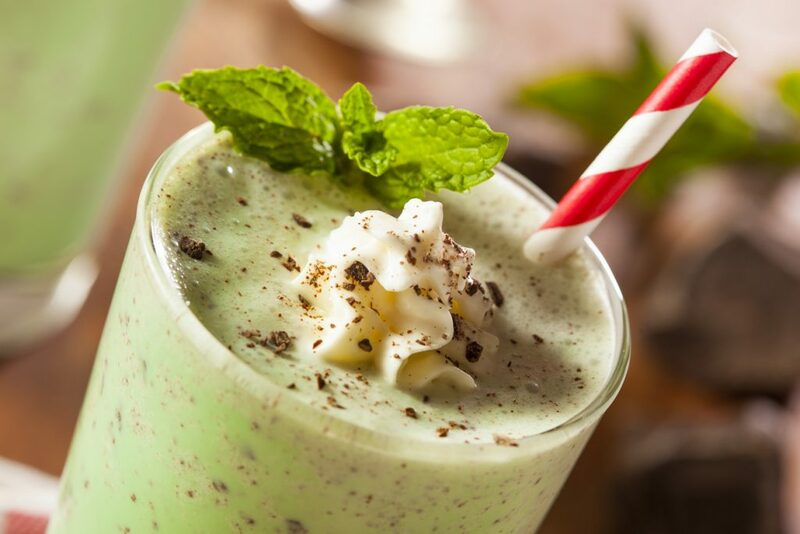 We rounded up our favorite copycat Shamrock Shake recipes so you can enjoy this minty treat at home with your own ingredients. Instructions: Blend first three ingredients together. Add food coloring for desired green coloring. Optional whipped cream and cherry on top. 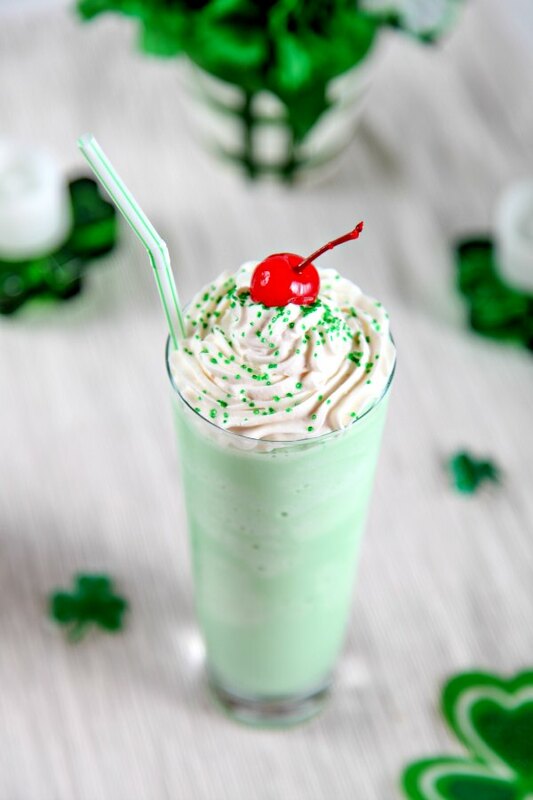 If you’re looking for an even healthier way to enjoy a Shamrock Shake from the comfort of your home, check out this recipe we created (Weight Watcher points included). Instructions: Blend items together and add green food coloring. *For this recipe, I would recommend not adding the whipped topping. This milkshake is sweet enough all on its own!